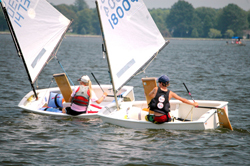 The Miles River Yacht Club Foundation was established in 2010 to support youth-oriented competitive sailing and swimming and maritime-focused educational activities in the Chesapeake Bay region. The Foundation, although totally independent from, is affiliated with the Miles River Yacht Club of St Michaels, MD. The MRYC Foundation is recognized by the Internal Revenue Service as a 501(c)(3) tax-exempt organization, and gifts to the Foundation are deductible to the extent allowed by law. Governed by an independent Board of Directors, the Foundation carries out its mission through grants of facilities, equipment, scholarships, and general support to organizations, programs, and individuals who support the mission of the Foundation.